Potato Phyllo Pie is not only easy and simple but it is also tasty and filling. Forget about traditional pies, this savory and flavorsome potato pie makes a perfect potluck food too. 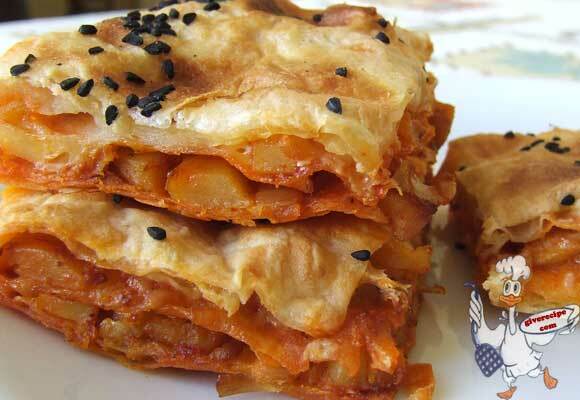 Potato Phyllo Pie is just another type of Turkish borek. It is one of my favorite Turkish recipes and one of the most common pastries served to guests here. I generally make borek at the weekend as a preparation for week days. As I leave for work early in the morning, borek becomes my best breakfast. You know how much I love breakfast. During weekdays, I don’t have enough time for a big breakfast though. 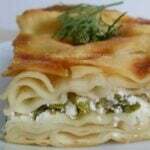 If we have prepared borek in the refrigerator, I just heat them in oven or in a pan on the stove. The best quick breakfast for me! Moreover, if I have something different for breakfast, I put a few potato phyllo pie squares in my lunch bag and take it to work. It becomes a perfect lunch accompanied by a glass of ayran as borek is also eaten cold. When I take some for lunch, I always take more than I can eat because I love sharing lunch with my colleagues. Potato Phyllo Pie is easy to make yet it is one of the yummiest savory pies. Boil the potatoes in a pot full of water until they get very soft. You can check them with a fork, insert it in one of the potatoes, if it’s soft enough, that’s ok. Then peel the potatoes and chop them in small pieces. Put it aside. Chop the onion and saute it until golden. Add tomato/pepper paste into it and stir. Put the boiled and chopped potatoes into it, sprinkle salt and other spices and saute all of them for 10 minutes. Stir occasionally. Take it from heat and let it cool. Lay another sheet on potatoes and spread yogurt mixture again. Now put the rest of the potatoes and sprinkle grated yellow cheese on it. Lay the last two sheets on them spreading yogurt mixture between them. Finally spread all the mixture on top of it to have a well cooked borek. Cut it into squares. And sprinkle some nigella sativa on it. Cook it for about 40 minutes. Now we’ll prepare the mixture to stick the phyllo sheets. Mix yogurt, oil and egg until well combined. This mixture prevents the borek from splitting off. Preheat the oven to 180C (356F). Lay one of the phyllo sheets on an oven tray. Then spread the yogurt mixture on it with a brush. If the sheet is too big for the tray, you can tear it into two pieces and then lay it on the tray. It doesn’t need to be perfect in shape. Then lay another sheet on this one. Spread some yogurt mixture again. Now put some filling mixture (not much as you’ll put the rest soon). This looks good, I wish I was like my mum and be able to make my own pastry but I know I am not…..Anyway, I like the simple way you have made the dish and I love Filo pastry extra but I have a question what is Yellow Cheese? You can say it in Turkish and I am sure I can translate it then myself. This looks so good! I have to try making one for my parents. They found a place that sells borek and fell in love with them but I don’t think they’ve had a vegetarian one yet. I really love the nigella seeds on top. They have a great flavor that goes so well with potato. Thank you Monica for giving a great idea for its filling. I love celery and I’m sure it tastes very well in borek. I made this last night after seeing it on tastespotting. I added some celery to the potato filling, since I needed to use it up. It was fantastic! It wasn’t like the borek I would get at the Turkish restaurant by campus, but it was delicious. Zerrin, this makes my mouth water,…..yet again!! This looks so lovely & yummie :)!! Great recipe!! I wish they had these at the coffee bars instead of only sugary pastries! Will try this recipe too Zerrin. You keep making such fabulous foods that I can barely keep up with you! This such a delicious treat to have on hand! All those flaky layers filled with goodies in between, mouth-watering! Gera – We learn a lot from our grandmas. Mine was good at making flour halvah. Natasha – Yopu can also try it without cheese, but I think it adds a lot to this borek. Tangled Noodle – Happy to hear that you found it at last. I also appreciate your efforts for searching it. Now you can try any recipe you like. and yes, this borek is so eay to make. lisaiscooking – They help me a lot in the mornings and lunch time. Christelle – It’s so easy to make borek with these phyllo sheets. You should try. Digigirl – I’m sure you’ll love this when you try. and thank you for stopping by and commenting here. vanessa – It tastes wonderful with cheese and potato together. And thank you for stumbling. I have had borek with cheese. Never like this… man this looks so good and hearty! I tried to digg your post, but I am not sure if it worked. But I stumbled you. I love savory pasteries like these. Oh, I am so excited. I cannot wait to try. Yum! I’ve never heard of this before, but your picture looks awesome. And anything with crispy phyllo, potatoes, cheese… well, it makes my mouth water just to think about it. This sounds like a great make-ahead dish. The filling sounds delicious! What I love about your recipes is that, at first glance, they look delicious but rather complicated. But instead, the ingredients and method are really quite easy and straightforward! This is a wonderful dish. And just to let you know, I finally found grape molasses! I found it a grocery store that specialized in Mediterranean and Middle Eastern groceries. In search for the syrup, I found so many other foods that I would love to try. Now, when I read your recipes and see an ingredient that I’m not familiar with, I’ll check at this store! Love the cheesy potatoes and it sounds excellent with phyllo – great recipe!